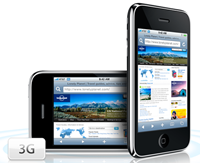 No 3G For iPhone In India! Bharti Airtel and Vodafone, both are bringing the iPhone 3G to India and have started bookings for the phone as well. But what no one is talking about right now is that there is actually no 3G network in India yet. If we look at the promises the telecom department has been making for the past few years, there is no deadline for 3G roll-out in India. There was a dialogue in Matrix movie where Neo, when arrested by agents, asks for a phone call. Agent Smith says, “How good is a phone call, when you can’t speak?” as he had sealed his lips. So, here one can say, “How good is the iPhone 3G when there is no 3G network in the country?” Should consumers fall for that and buy iPhone 3G, which will not be able to offer 3G services despite being a 3G device? When Will It Be 3G? It is going to take quite a while for Indians to reap the benefits of 3G that the device offers? Looking back in history, there have been more promises made than met. The frequency that 3G networks use was assigned to defence forces in India, and it took quite a time to release that frequency as defence forces needed to build the infrastructure to migrate from that frequency. That was followed by the expulsion of the much adored minister Dayanidhi Maran due to some political issues. The change of minister further delayed the arrival of 3G in India. A. Raja took over as the minister of communications and information technology in May last year and after taking his time to settle down has started the 3G drive. The government is trying to put things in place by announcing 3G guidelines and policies. There will soon be an auction of the 3G spectrum in India by the end of September. process to be conducted by a specialised agency. For the Spectrum blocks released to them, BSNL and MTNL will pay a price equal to the highest bid in the respective service areas,” a press statement says.